Nasanta Natural Deodorant is a pretty unique natural deodorant. Right now, it is sitting at 4.2 stars on Amazon, as well as sporting a badge for "Amazon's Choice". This means it comes highly recommended by Amazon and by other customers. Let's dig into this natural deodorant and see if it lives up to the hype. Nasanta Natural Deodorant is a roll on, stick deodorant. Most people are more than used to the stick deodorant so this is obviously the most popular choice for people just getting into the natural deodorant game. Plus it is pretty much the best overall choice, as it both deodorizes and absorbs sweat well. Many natural stick deodorants are usually made up of a form of natural oil or butter, like shea butter, along with baking soda, or one of the other natural absorbents, and essential oils for the fragrance. In fact, there are several essential oils that are antibacterial by nature, like tea tree oil or neem oil. This natural deodorant is based around its name ingredient. That ingredient is magnesium. Magnesium is a very important compound that humans need for energy production, nerve transmission, protein synthesis, muscle relaxation, and many other body functions. In deodorant, magnesium is among the best natural ingredients for fighting body odor. The full list of ingredients in Nasanta Natural Deodorant are as follows: Deionized/Purified Water (Agua), Magnesium Hydroxide, Glycerin, Xanthan Gum. It is always nice to see a short list of ingredients, as natural deodorant really only needs the necessities. All of the ingredients in Nasanta Natural Deodorant are naturally derived. However, one ingredient that seems to be missing is an absorbent ingredient. This tells me that this is purely a deodorant, and does not act as an antiperspirant. So for those who struggle with a lot of sweat, this is probably not ideal product for you. Nasanta Natural Deodorant is looking like one of the healthiest deodorants we have reviewed here. It is free of basically anything that could potentially be bad for your health. It is free of aluminum, paraben, alcohol, and fragrance. All of which can casue skin dryness or irritation. In addition, this natural deodorant is completely safe for sensitive skin. It does not contain any sodium bicarbonate, otherwise known as Baking Soda, which many people are sensitive to or have an allergy to. So you will not have to worry about any rashes when using this product. What's more, the deodorant is cruelty free, meaning it was never tested on animals, and it does not contain any animal ingredients. So if you are vegan, may want to check this out. In terms of the packaging, the deodorant is stored in a BPA free glass bottle, so there is little plastic used here, which is awesome for the environment. While there is not a lot available in terms of the company, there was some information found about their products. The company is based in Sydney, Australia. They source their magnesium, which is their main ingredient for all of their products, from Japan. Surprisingly, their magnesium deodorant is their only product they manufacture. However, this can actually be a good thing, because it allows the company, Nasanta, to put all of their focus on making a great product. Nasanta Natural Deodorant is formulated by cosmetic professionals and made in Sydney, Australia in a GMP and ISO certified facility. The company seems to take great pride in their product. They are well aware that it is not an antiperspirant. In fact, they actually market it as such a product that promotes natural perspiration. Their products are made for both men and women, so anyone can use it. Nasanta Natural Deodorant is made in a roll-on stick style. This makes the transition from commercial brands to natural a bit more comfortable. This deodorant is completely natural and only contains 4 ingredients. It's main ingredient and what the deodorant is named for is Magnesium. Magnesium is a natural odor blocker, being able to kill odor causing bacteria. 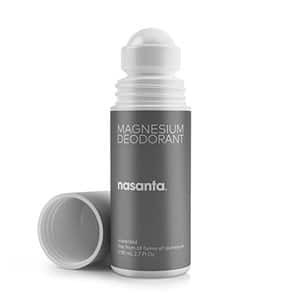 In addition, by using Nasanta Natural Deodorant, you get a boost of magnesium in your body, which is always good. Nasanta Natural Deodorant is one of the healthiest deodorants we have seen. It is free of aluminum, alcohol, and parabens, along with coming in a BPA free bottle. The deodorant is also cruelty free and free of animal ingredients. If you have sensitive skin, this is the deodorant for you. There are no skin irritants here, like baking soda, which can sometimes cause a rash. You can even use this after you shave, and it will not sting or cause irritation. Nasanta Natural Deodorant is only a deodorant, it does not work as an antiperspirant. Commonly misunderstood, deodorant does not automatically make it an antiperspirant as well. This product simply kills odor causing bacteria. There is nothing included to make you smell better or prevent you from sweating. If you are looking for an all around deodorant and antiperspirant, this is not the product for you. Unfortunately, that is what most people are looking for. When people set out to find a deodorant, they are usually looking for something that will not only keep them smelling good, but also keep them from sweating through their clothes. With Nasanta Natural Deodorant, all you are getting is something that will fight body odor. This stuff does not even give you a different fresh smell, it just keeps you from smelling bad, which is of course needed. Judging Nasanta Natural Deodorant for what it is made to be, rather than what people want it to be, it seems like a very good product. It knows that it is not an antiperspirant and does not try to be or come off as such. It does one thing, and it does it seemingly well. So if you want to grab a 2.7 ounce bottle of this to try out, you can find it on Amazon for $14.90. Since it is a bit expensive, be sure you know what you are getting before assuming it is something it is not. For any other information, including the best natural deodorant for men, head on back to Green and Growing. Here are some top questions that I found for people seriously considering buying Nasanta Natural Deodorant. Does this work as an antiperspirant as well? No, this is only odor control. Is this toothpaste good for sensitive teeth? The abrasion point of this toothpaste is about 70, which means it is rather gentle. However, it is still best to consult with your dentist before using. What is the pH of this toothpaste? All of the Himalaya toothpastes fall in the range of 8.0 to 9.5 pH.